Jimmy Butler doesn't see himself playing deep into his late 30s. LOS ANGELES – Jimmy Butler has an idea when he’s going to retire from playing in the NBA. “I don’t plan on playing this game when I’m 35 years old,” Butler said. That came in response to a question about how he thinks he’ll be able to perform at 35. How many more years does the four-time all-star think he’ll play? The eight-year veteran won’t turn 35 until Sept. 14, 2024. He could play five more seasons before that time comes. Ironically, the Sixers could offer him a five-year, $190-million max contract next summer, if he opts out of the final year of his deal. If both sides opt to go that route, the Texas native could end his career as a Sixer at the age of 34. That would provide security for both sides. The Sixers would lock up a third star to play alongside Ben Simmons and Joel Embiid for the next five seasons. Meanwhile, Butler would have a financial benefit by re-signing with the Sixers. They can offer him a better deal because he is their free agent. Other teams could only offer him a four-year, $140 million max contract in free agency. So far, his tenure with the Sixers has been better than expected. 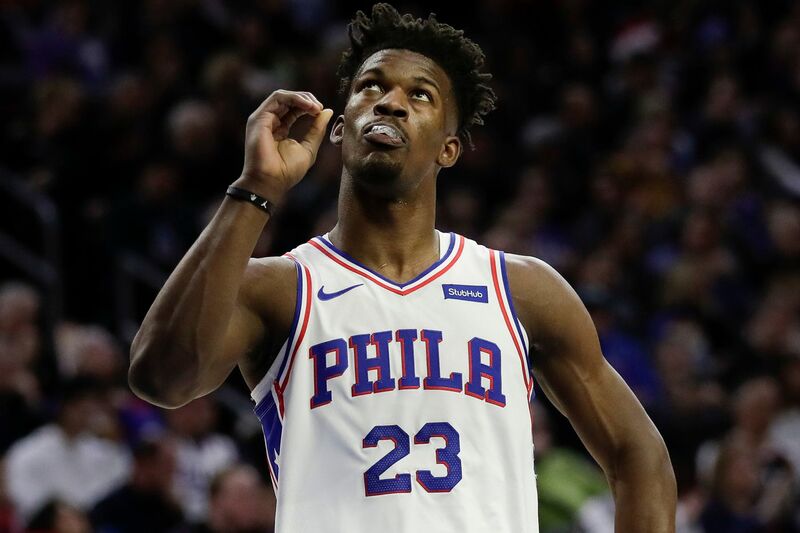 There were concerns with how he would interact with teammates, especially Simmons and Embiid, after being acquired in a trade with the Minnesota Timberwolves on Nov. 21. Butler had issues with young Minnesota stars Karl-Anthony Towns and Andrew Wiggins. He also had issues with younger teammates as a Chicago Bull. But Butler has been a delight for the Sixers. He has assumed a leadership role and has been a great teammate. He’s also displayed his giving side. Butler gave folks in the basketball operations-side of the organization a pair of Air Jordan sneakers as a thank-you gift after the trade -- about 67 pair in all. Comporting himself as a consummate professional haven’t gone unnoticed. “The way he takes care of his health, his body, and his habit, and how hard he works, it just flows through the team,” general manager Elton Brand said. That’s why the Sixers aren’t concerned about the negative possibilities that could come with signing Butler to a five-year deal. Most players’ production declines in their mid-30s. And being on the hook for around $38 million annually for a declining player with an injury history would set a team back. Butler suffered a knee injury last season. Butler has averaged 31.8 minutes in his 20 games with the Sixers, the lowest since he averaged 26 minutes in his second year with the Bulls. The reduced minutes should keep him fresh for the postseason. It should also allow him to continue playing at a high level longer in his career.